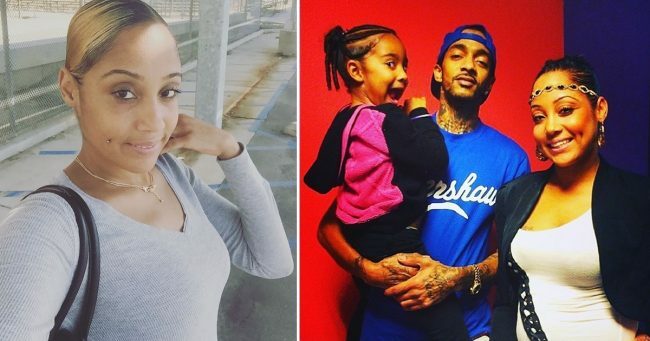 Tanish Asghedom, the baby mama of Nipsey Hussle’s first child Emani Asghedom, has remained silent after the death of Hussle. Many publications and fans began to wonder why she was forgotten, and why she did not participate in the memorial service. Asghedom was not at Hussle’s “Celebration of Life” ceremony with her daughter who was so distraught and needed her mother’s support. Asghedom wrote on her Instagram: “I love you always Ermy. You know when I am mad at you it is Ermias Joseph. I love you so very much.” Ashghedom has a Twitter account under the name tanisha @chynahussle but has not used it since 2012. Despite Hussle being in a relationship with actress Lauren London for the past five years, Tanisha Asghedom Mother of Nipsey Hussle’s Daughter Has Been Forgotten who uses his last name despite never being legally married, told fans the two never broke up. Asghedom also tweeted at London saying that Hussle still loved her, and now that she knew she could now block her. Hussle and London also have a 2-year-old son Kross Asghedom, who did appear at the “Celebration of Life” ceremony. London recently had a tattoo of Hussle’s face inked on her arm.